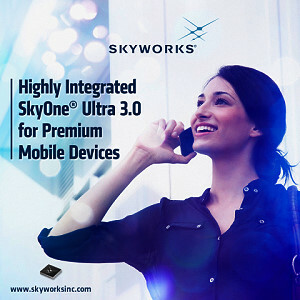 Skyworks Solutions, Inc. (NASDAQ: SWKS), an innovator of high performance analog semiconductors connecting people, places and things, today introduced SkyOne® Ultra 3.0, a highly integrated front-end solution for premium mobile device and smartphone manufacturers worldwide utilizing Skyworks' powerful SkyBlue™ enabling technology for industry-leading efficiency. SkyOne® Ultra 3.0 is a fully optimized front-end system that incorporates all of the high performance RF and analog functionality including power amplification, duplex filtering and antenna switching into a single device. The module integrates low noise receive amplifiers, allowing customers to achieve much better sensitivity levels than previously possible. SkyOne® Ultra 3.0 supports all major carrier aggregation (CA) combinations, meets class 2 high power user equipment (HPUE) requirements and addresses 2.5G/3G/4G handsets for more than 23 bands of LTE. "By leveraging our broad systems expertise and in-house filter capabilities, Skyworks continues to push the integration envelope, bringing best-in-class, high performance solutions to customers worldwide," said Joel King, vice president and general manager of Advanced Mobile Solutions for Skyworks. "Through systems like SkyOne® Ultra 3.0, we turn complexity into a simple and turnkey solution, unburdening our customers from demanding RF challenges and ensuring a seamless connectivity experience while reducing their time to market." Skyworks representatives will be in Hall 2, Stand 2F18. Skyworks is a global company with engineering, marketing, operations, sales and support facilities located throughout Asia, Europe and North America and is a member of the S&P 500® and Nasdaq-100® market indices (NASDAQ: SWKS). For more information, please visit Skyworks' website at: www.skyworksinc.com.